Is Pentair Sand Dollar or Jandy JS Side Mount Sand Filter Better? There are a lot of brands and even more models in the pool equipment world. It can feel overwhelming, especially if you're a new pool owner. Here at River Pools, we enjoy making the pool-owning life easy for you. Welcome to our comparison of Pentair vs. Jandy filters, Part 2! Pool filters are categorized as cartridge, sand and D.E. filters. Cartridge filters: Pleated polyester filters catch dirt and debris that's 10–20 microns and bigger. Sand filters: The dirty pool water filters through the sand in the tank. The sand catches dirt and debris that's 20 microns and bigger. Diatomaceous Earth (D.E.) filters: A set of grids/fingers are coated with crushed seashells and fossilized diatoms, and they catch dirt and debris that's 5 microns and bigger. Are Jandy or Pentair Pool Filters Better? In this 3-part series, we're comparing 3 pairs of Pentair and Jandy pool filters. In Part 1, we discussed their cartridge filters. Today, let's talk about their sand filters! The Pentair Sand Dollar filter works for pools with 36,000 to 54,000 gallons of water. Filtration area options: 3.5 sq. ft. Reminder: "Filtration area" refers to the surface area of the filter media—in this case, the sand in the tank, which does the actual filtering. For more details, check out What Does a Pool Filter's Filtration Area Mean? Plumbing size: 1.5" and 2"
A note from the pro! It was weirdly difficult to find the exact measurements for the drain. It wasn't on the specs or the user's manual. I had to search the replacement parts manual for the model # of the sand drain, then search for that part on multiple websites. Shoutout to Inyopools.com for actually providing the dimensions. For shame, Pentair—you should provide the dimensions on the product page. Warranty: On the Warranties page, Pentair warrants their products to be free from defects in material and/or workmanship for a period of sixty (60) days (parts only) from the original date of purchase and/or installation. They also warrant their filters specifically for 1 year. Plus, some preferred dealers (like us!) get a 3-year warranty if they use 3 Pentair components on a single pool. This filter is top mounted. Its 6-function multi-port valve lets you easily control all filter functions. It's a combination water and sand drain for easier service and winterizing. According to the product page, it removes particles "up to 5 times smaller" than the traditional 50–100 micron range. However, Pentair doesn't give an exact number. The filter uses a 1-piece thermoplastic tank for strength and corrosion resistance. 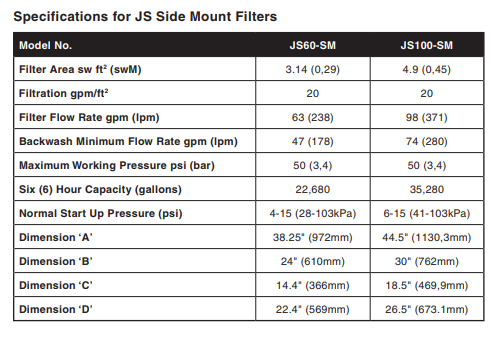 The Jandy JS Side Mount Sand Filter works for pools with 22,680 gallons of water or more. Filtration area options: 3.14 and 4.9 sq. ft. Reminder: This refers to the surface area of the filter media—in this case, the sand in the tank, which does the actual filtering. Tank port size: 2 in. Sand requirements: 225 and 425 lb. Warranty: Zodiac/Jandy warrants their products to be free from manufacturing defects in materials and workmanship for 1 year. Zodiac/Jandy still hasn't figured out that they should link to the warranty info on the product page and/or site menu. Come on, guys. Get it together. It's sketchy that you're not upfront about the warranty. This filter is side mounted. Jandy never specifies how many microns it catches in dirt and debris. That's suspicious too. It's always better to say upfront how many microns it's good for, rather than make the customer guess, even if it doesn't filter as well as its competitors. It includes a clean/dirty indicator on the pressure gauge. 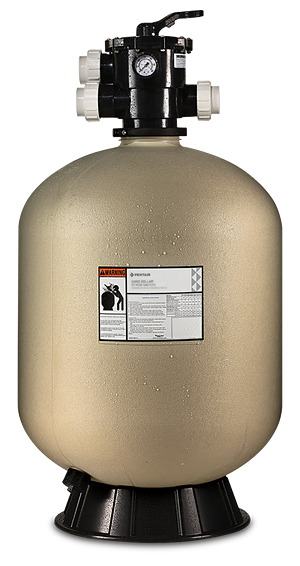 The tank is a heavy-duty, durable composite body made of corrosion- and UV-resistant material. Average online rating: insufficient data. There weren't enough online reviews to get a real sense of customers' opinions. Both brands' filters have a one-year warranty, and work up to 50 psi. Jandy's side-mount sand filter has 2 different size options, 8 spokes (laterals), and a clean/dirty indicator to help you time the maintenance. However, they don't provide the warranty easily. They provide no micron info at all and only minimum turnover calculations. There are almost no online reviews/ratings to support it. 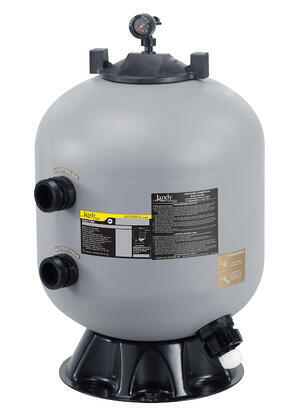 Pentair's top-mount sand filter comes in 1 size with 6 spokes (laterals). It's less expensive and actually has online customer reviews to back it up. However, they don't provide the drain width or exact micron data upfront. Want more info about inground pools? River Pools manufactures and installs fiberglass pools in Virginia and Maryland. We also operate across the country through our nationwide dealers. If you're interested in a fiberglass pool, get in touch with us! We'd love to talk with you. You can also check out our Ultimate Guide to Inground Swimming Pool Maintenance. We want to help you make the most of your pool! Previous: Is Pentair Clean & Clear Plus or Jandy CV Cartridge Filter Best? Next: Is Pentair FNS Plus or Jandy DEV D.E. Filter Better?